HDFC Bank launches SME Banking Services in India. This past week, HDFC Bank announced their next step in the mobile-first digital world, the SME Bank. This SME bank will serve as a primary banking service for the Small and Medium Enterprises, which is why the term SME. The clients can witness the full advantage of this service as it can be accessed anytime, anywhere. May that be on a Laptop, Tablet or a Smartphone. 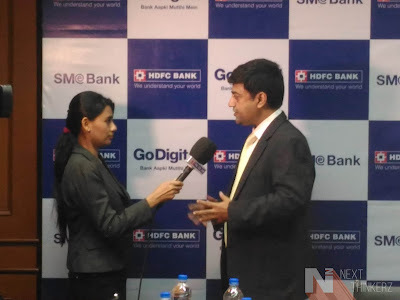 The event commenced in the presence of Mr. Aseem Dhru, Group head-Business banking HDFC Bank. So Today let's understand, How does this SME service differentiate from the current banking riddle?. It is a digital bank which chops down your wastage of time as you no longer need to run towards a branch or attend any calls with the office manager. Put forth, Everything's Online. This service would also be available for existing users. Whereas SME banking strengthens the Backbone of the "Aapki Mutthi Mein" Campaign, which was launched back in December 2014 in Varanasi. The existing corporate clients would be benefitted immensely with the services offered by SME Bank. By SME Banking, HDFC is providing its Users speed, reliability & transparency. This, in turn, acts as a great source of making things readily available on their finger tips, thus saving your time. Businesses can witness an increase in their productivity space due to SME, Which helps in country's GDP & employment opportunities. The number of units – 3.6 crores. Contribution to country’s GDP – 8%. Dedication to India’s manufacturing output – 45%. Contribution to country’s exports – 40%. People employed in India – 8 crores. What differentiates SME Banking from Conventional Banking? As discussed earlier, Existing clients are presented with an additional digital platform for their banking needs, as they can control their bank account remotely. A User can access the information about the maturity date of the letter of Credit, receive their entire bank balance without the hassle of writing a cheque, know the foreign currency remittances, Bank guarantees & Import bill under LC from the clients office. Required Documents can be uploaded for accessing the continued facilities. You also receive offers beneficial for your customers such as alerts and tickers based on the trending analytics data. QR code is sent to make sure that there is transparency and users can track down the status of their transaction. Clients have the ability to request Seasonal or Additional limits according to their requirements. Whereas based on the analytics, the necessary money could be transferred to their accounts immediately. Mr. Aseem Dhru addressing the media. Thus HDFC Bank is stepping into a new direction by offering additional facilities to their existing customers & extending the value that is delivered. This campaign suits in well with the word - Digital India & We hope it reaches more and more remote areas once it's launched. So starting next month or at the earliest, HDFC Bank will start offering these features to their existing customers. Later on, it'll be offered to new customers as they join on board with HDFC. Also See: UCWeb launches UC News & Upgraded UC Browser Exclusively for Indian Audience.